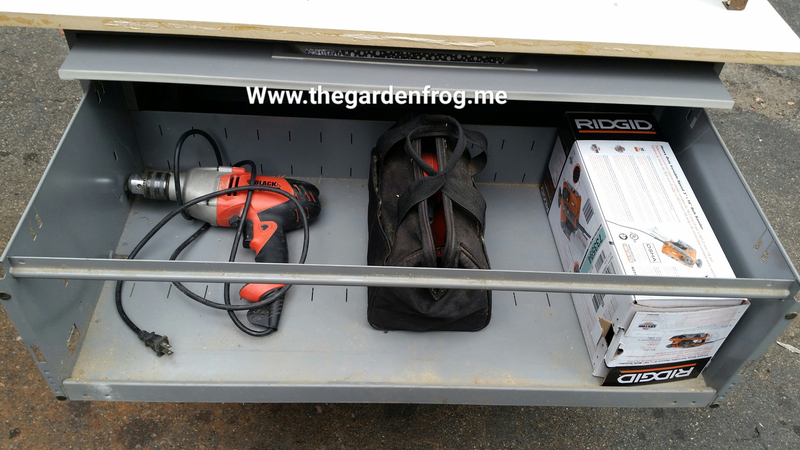 Organizing does not have to cost a lot of money. 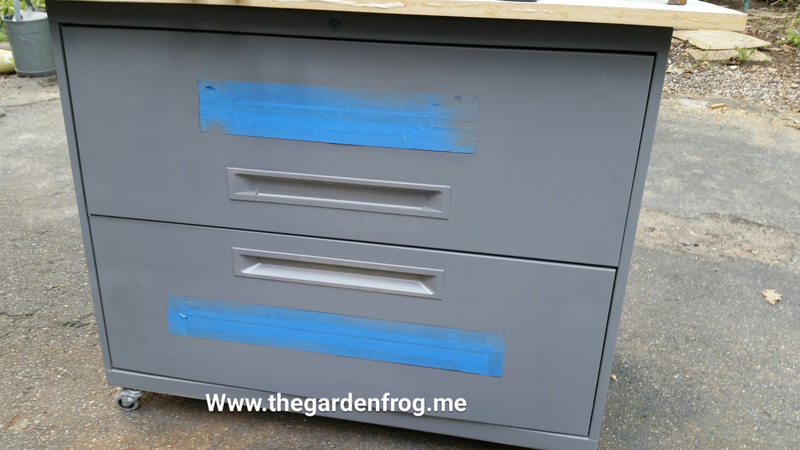 You can easily create storage centers or work stations out of old dressers, crates, and in my case an old lateral filing cabinet. 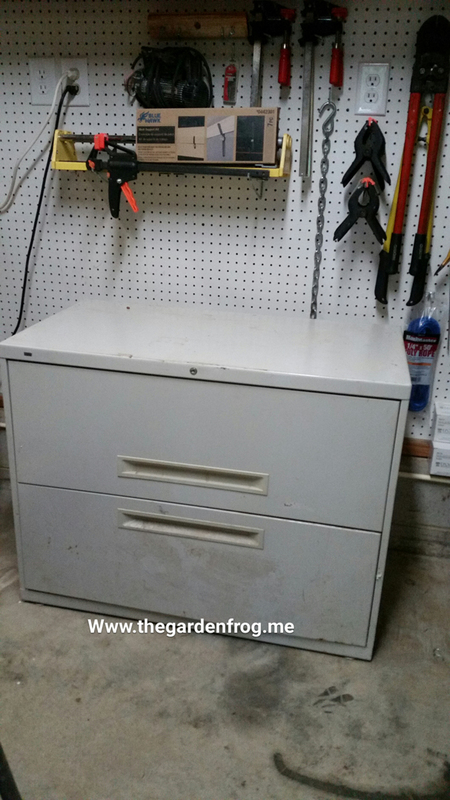 You do not have to be artistic or worry about being too creative in your own garage. I aim for practical because in my garage things get dirty, scratched, and dropped. 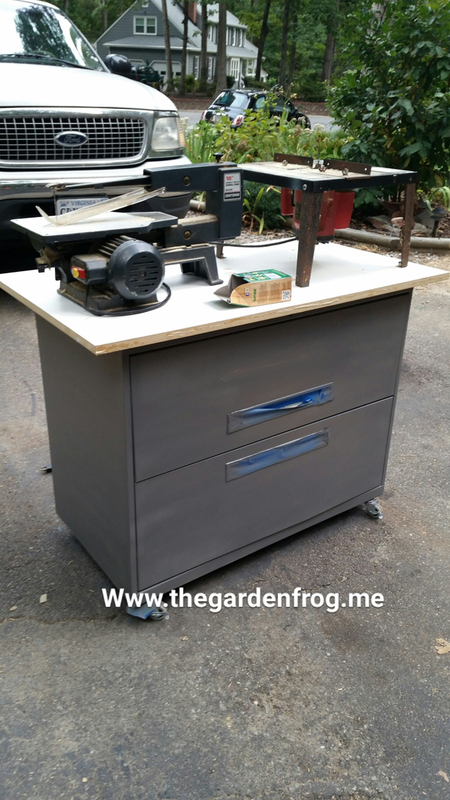 Since my garage is a shared space of tools and projects, I knew I was not going to paint the filing cabinet anything too feminine or fancy. Practical and refined. 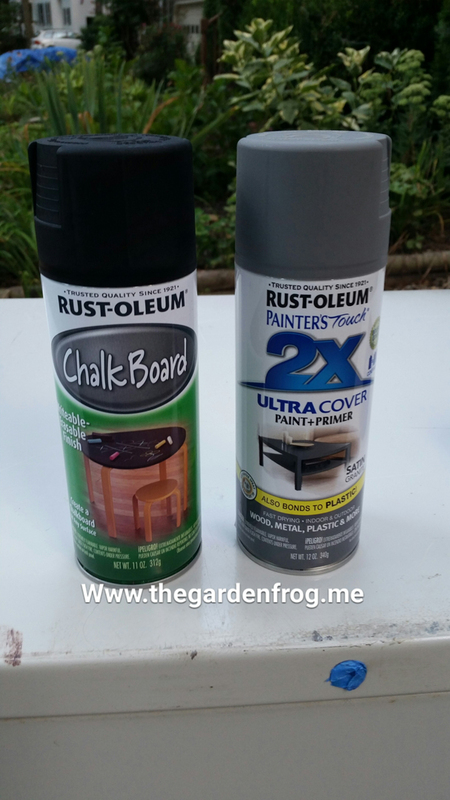 I ran to Home Depot for Rustoleum’s Granite and Chalkboard paint and ended up with 3 light coats to cover the cabinet. I made a bad choice in not covering the piece before spraying the chalkboard paint (hence the 3rd coat of gray). I also picked up 4 wheels to attach to the bottom. 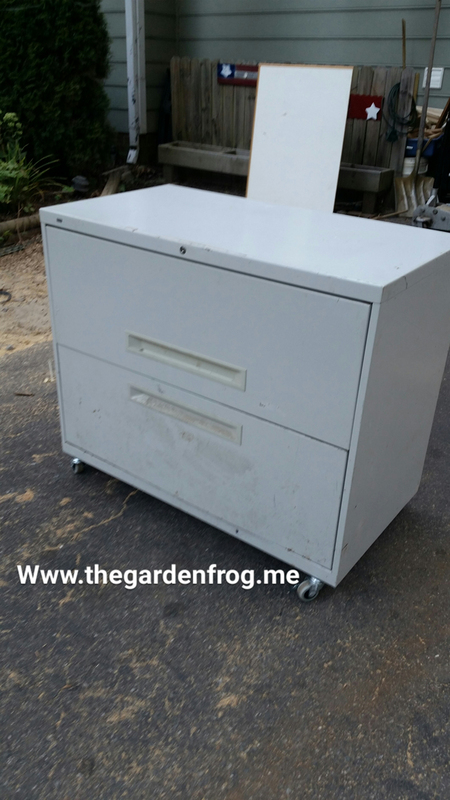 I took the leveler/pegs out of the bottom of the filing cabinet and thought I had scored the jackpot when I found wheels that would screw in place of the metal pegs I took out. They were a bit loose so I put on some plumbers putty thinking it would tighten them up. It did but it was not enough to keep the wheels from bending the metal holding the wheels in place (on the filing cabinet). Okay I admit- EPIC Fail so back to Home Depot to get larger wheels that I could put on with self tapping screws. 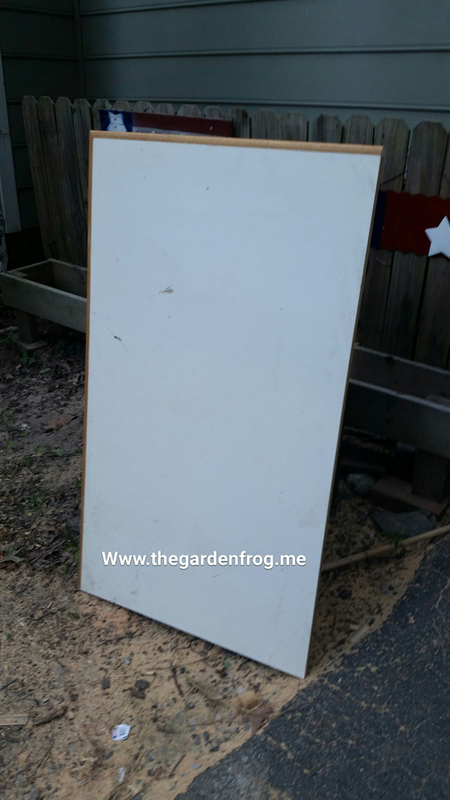 Then I had a top which I got from the neighbor’s garbage last year that was actually sitting on the filing cabinet for much needed work space (in all reality it was another dumping ground for stuff). Anyhow, I took off the trim and used 2 L brackets I had in a bin from God knows where and what project. 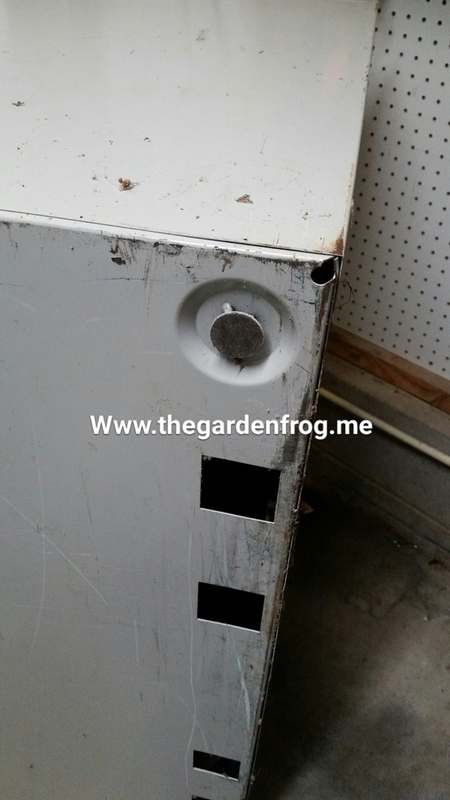 I also tried to screw down the top with self tapping SPAX screws but only a handful went through the metal top. 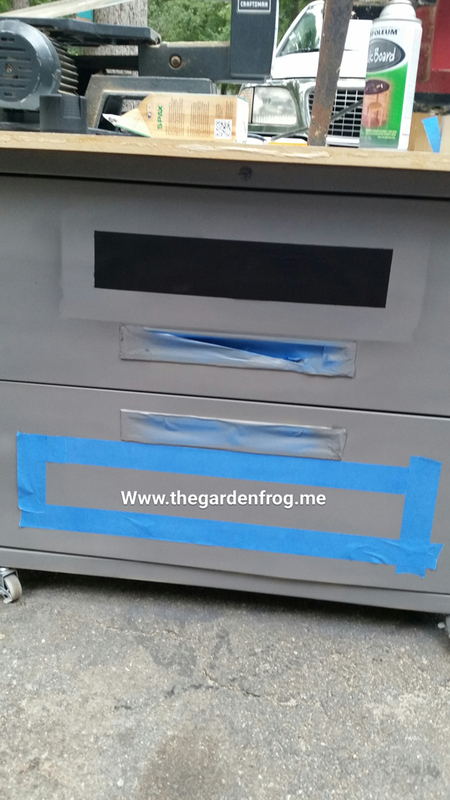 Filing cabinets are made of some very strong steel. I may have to add more L brackets if I feel the top getting loose from pushing it in and out of the garage. 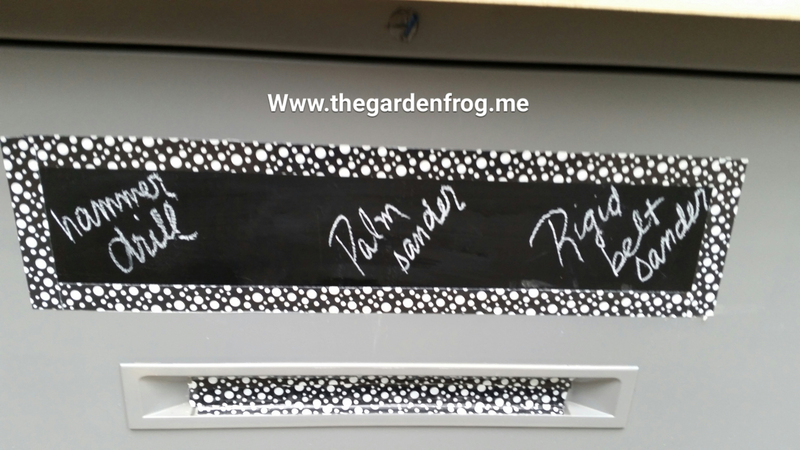 I just had to ‘jazz’ it up a bit and so I remember I had some small duct tape (kind of like the washi tape the crafters are using) in my craft room from sometime in the past when it was on clearance for next to nothing. I love when my impulse clearance buying pays off. 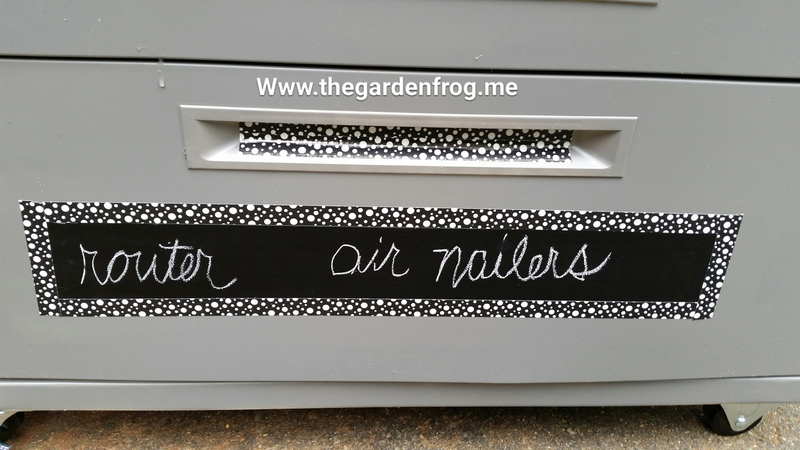 I used the duct tape to make a frame around the chalkboard paint and since I had already scratched the paint on the handle to open the filing cabinet, I decided to use the tape to decorate the handle since the paint scratched to easily. I initally made wood trim for the chalkboard rectangles but after I glued on the top one I realized that the door would not open and slide into the top so I could open the drawer. Ugh so I had to pry the trim off. Thank goodness I realized this after only a couple minutes when a little voice told me to open and close the doors to make sure they would work. Whew, I am so glad I have that little voice. 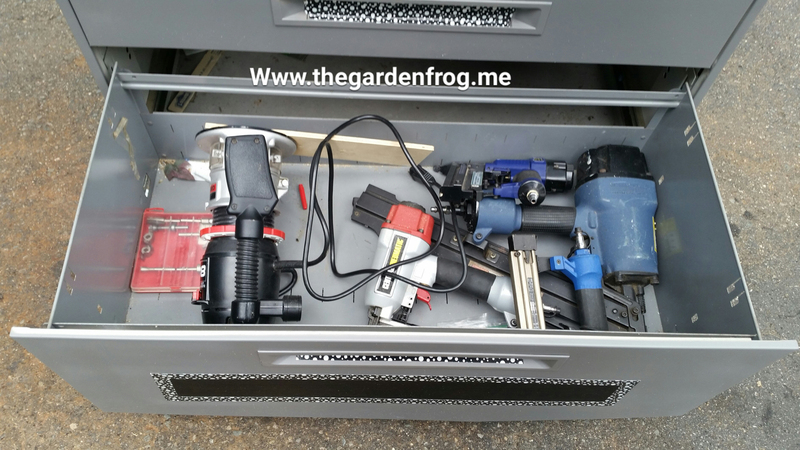 I wanted to label the drawers just in case hubby needed to use my tools. Plus if you label things you have to put them back (at least in theory). Since my hubby is not home this weekend I texted him a picture of the finished bench and his comment was “pretty”. When I called him he said no one will mistake your work area. I said “really” and he said “yea because your stuff looks prettier than mine”. He did admit to me he is happy that I did not paint it pink or some other bright color. I am too because bright colors show dirt and sawdust more. I hope I have inspired you to start or finish that project that has been sitting around in your garage. For me, it is such a relief and sense of accomplishment to create and finish a project that has floated in my head for a long time. 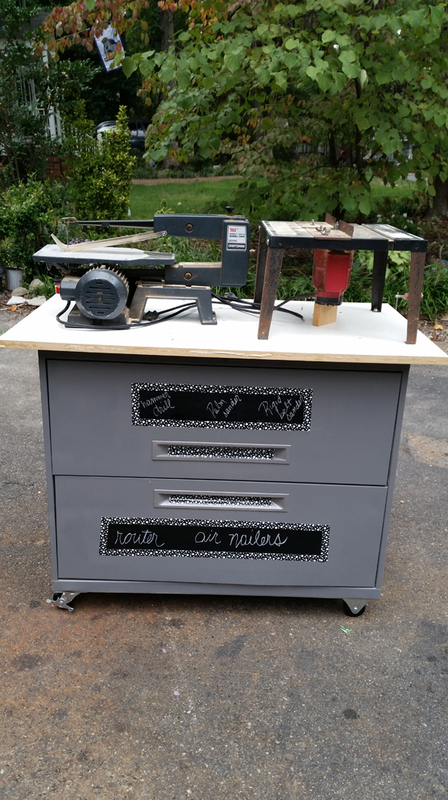 The project cost me around $35 for 3 cans of spray paint and 4 wheels which is well under $200 price tag for a rolling workbench at the store. 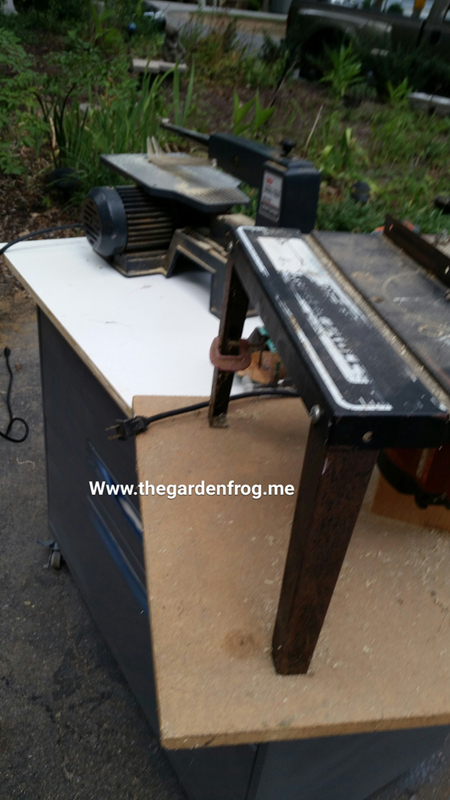 I could have left it stationary but since I am using it for one of my routers and my scroll saw I wanted to be able to push it outside to work. 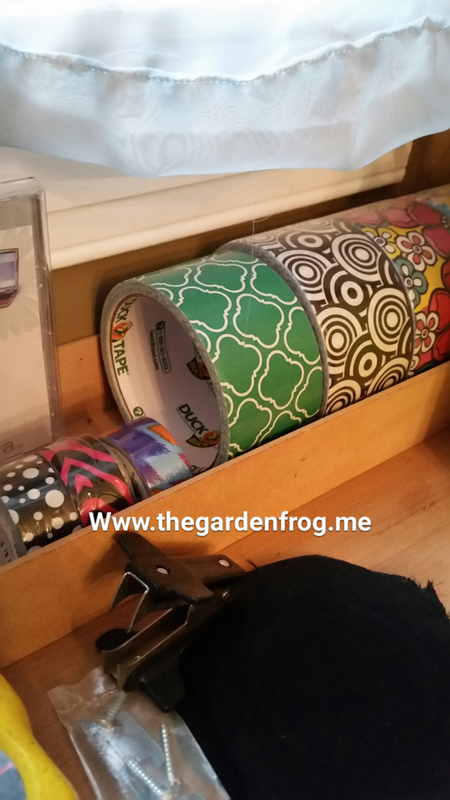 Getting organized or creating does not have to cost a lot of money!